Derby Shilton, Sage, Cross, G Williams, Wright, Forsyth, Micklewhite, Saunders, Harford, Ramage, Callaghan- Used sub Hebberd, Unused sub Davidson. 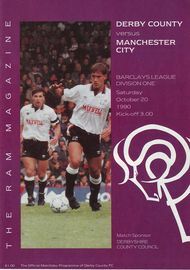 …The opening goal came from City, a penalty slotted home by Mark Ward after Niall Quinn had been brought crashing down by Derby’s Michael Forsyth in the first minute. …Sadly the Blues again proved they were incapable of holding on to a lead, a feature of away games that season. Punch up front was missing and Peter Shilton had only one shot to save in the entire game. 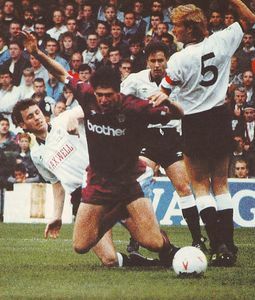 Derby battled away but many of their attacks floundered on the rocks of the City defence, Steve Redmond and Colin Hendry. “It was their best 90 minute performance since I arrived at Maine Road” enthused the Blues’ boss after the game. …Derby’s persistence eventually paid off. After 72 minutes, Shilton clouted a mighty clearance up field directly to Dean Saunders, and the Welshman hit a 25 yard volley that gave Tony Coton no chance.